District Read-A-Thon – Sunday, February 26 – UPDATE! EXCITING NEWS: Kris Wilson, a Tight End for the Baltimore Ravens will be joining us at the Read-A-Thon along with a number of Penn Manor athletes as this year’s theme is Exercise Your Brain, Read a Book! The 12th annual Penn Manor Read Across America Read-A-Thon will be held on Sunday, February 26 from 2:00 to 4:00 p.m. in the Penn Manor High School gymnasium. Children of all ages are welcome to attend with a caring adult. 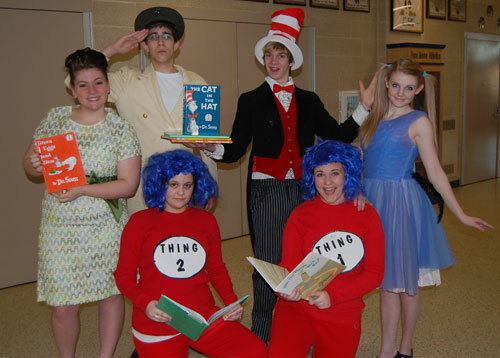 Cast members from the high school spring musical, Seussical, will be attending the event as well. Meet characters from some of your favorite Dr. Seuss books. You should bring a book for D.E.A.R. Time (Drop Everything And Read!) and if you are able, a new book as a birthday present for the Cat in the Hat. The books will be distributed to children who are less fortunate. In addition, you will get a book to take home after the event thanks to Millersville University SPSEA members! Please register by February 22 at 872-9500 x1515 or go to http:///pmreadathon.wikispaces.com/ to register to win Dr. Seuss items and gift certificates. Snow date is Tuesday, February 28 from 6-8 p.m.